Rozelle Tramway Car Depot was opened in April 1904 with a capacity to house 200 electric tramcars and some 400 personnel. By the 1930s, when Sydney’s tram system was second in size in the British Empire only to London’s, the depot provided services for the Balmain, Leichhardt, Abbotsford, Lilyfield and Birchgrove lines. Glebe Point trams were serviced at the Newtown Depot, adjacent to Newtown Railway Station and, like Rozelle, now derelict. Rozelle was the seventh of Sydney’s depots to come into operation, following Ridge Street, North Sydney (1893), Rushcutters Bay (1898), Ultimo (1899), Newtown (1900), Waverley (1902) and Fort Macquarie (1902). Leichhardt Depot, which opened in 1915, was used to store surplus tramcars. and Harold Park. The NSW Harness Racing Club now owns Harold Park, including the depot which closed in November 1958. By March 1959 there were reports of vandalism but the sheds remained reasonably damage-free until the year 2000. Since then the trams still on-site have been repeatedly smashed and the complex covered in graffiti. The war memorial, one of several erected by NSW Government Tramways, has disappeared and there is no trace of the beautifully maintained garden in which it stood. Leichhardt Street. A 1912 proposal to extend the track down Eglinton Road and through Rozelle Depot to join the Balmain line was rejected as conveniencing only a few and bringing in little revenue. A signal box at the City Road junction controlled the Newtown, Glebe Point and Balmain (via Derwent Street) lines. were transferred from Newtown, Waverley, Ultimo and Fort Macquarie depots. James A Steel, who lived at 37 Campbell Street Glebe, asked for a transfer from Waverley to be closer to home. Furniture and stock were ordered: Austrian chairs, cedar tables, wash jugs and basins, cash boxes, conductors’ badges and bags, ticket cases, drivers’ watches (although they were expected to note the time from public clocks installed at the Quay and Central Railway) and a revolver (not issued). On the night of 16 April 1904, a Saturday, 77 single and seven coupled cars were sent across. An emergency breakdown car was installed, ready to deal with a derailment or major accident. The 1904 Rozelle workforce included depot master Henry J Mark, senior clerk J C White, ledger and receiving clerks John O’Connor, R Crawford, R Barnes, B F Weatherstone, W W Wirrell and Henry W Chinchin. Office boy and junior clerk was Thomas M Emery who had trouble learning the telephone switchboard. C Parnell and Thomas F Ryan were the depot’s first shedmen, John Long and James Gower its first signalmen. Each allocated £1 in change per shift, 207 conductors (including E Faircloff, H S Henry and H E Wright transferred from Fort Macquarie) had to fiddle with halfpennies, deal with newsboys and basket-carrying hawkers jumping onto the cars, passengers expectorating and putting their feet on the seats, and tickets blowing onto the road – the City Council charged a litter fee. Oliver Collins, Robert Barber, Edward Gosnell, Francis Greenhalgh, Rudolph Bernhardt, William Avery and Alfred Mulligan were employed to clean the trams. ‘The new institution’, wrote the Daily Telegraph, ‘is a great improvement to the general appearance of the surrounding locality.’ Camaraderie among tramway employees was reinforced by the provision of staff amenities. By 1916 facilities at the Rozelle Tramway Depot Recreation Club included a billiard room (heavily used), a library, a hall for social activities and an outdoor miniature rifle range. ‘Fostering all kinds of manly sports’, its colours maroon and white, the club was open until 11pm on weekdays and 6pm on Saturdays. Employees paid two shillings to join then threepence weekly. Alcohol and gambling were prohibited. In 1921 the recreation building was enlarged. Mr Haggerwood was paid sixpence per tin by Balmain Council to remove garbage generated by the meal room. Activities of the Tramway Officers’ Social and Educational Club, formed in 1927, included cricket, smoke concerts, visits to factories and lantern slide evenings in the tramway instruction room at the Ultimo Power House. Staff doings were reported in the railway and tramway journal The Staff. Praised in 1930 was Rozelle driver Charles Perry who resuscitated a boy who had fallen into a canal. A regular column was devoted to gardening. Rozelle Tramway Depot was judged winner of the Champion Garden contest in 1928. Exposed to the weather and passing traffic as they balanced on external footboards to collect fares, conductors were in constant danger of falling ill or falling off. The NSW Government Tramway Band – including the Rozelle Depot Band – led funeral processions of dead colleagues to the Mortuary Station where they played ‘Lead Kindly Light’. The Tramway Sick and Accident Company, formed in 1884, covered sickness and funeral expenses. Rozelle Depot closed on 22 November 1958, a Saturday. The first bus to Glebe Point ran at 12.20am the next morning and the first to Balmain at 12.30am. In the city overhead wiring and tram tracks were hastily removed. 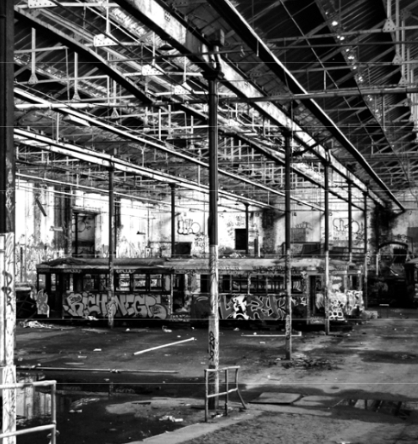 Tramcars were taken to the Randwick workshops where they were burnt at the rate of 12 a week. Replacement of trams with ‘one-man’ buses had for years been given the ‘highest priority’ by Alfred Shoebridge, the Commissioner for Government Transport under the Cahill Labor Government, grappling with increasing traffic congestion and private car use. Many condemned the loss of the trams as short-sighted and bus drivers disliked the one-man system. Shoebridge had 600 striking drivers dismissed in 1955. Removal of the tram tracks along Glebe Point Road was delayed because of haggling by the City of Sydney and the Department of Government Transport over who should pay. The dispute was resolved by 1966, the Council accepting responsibility for any claims arising from exposed rails in return for the costs (totalling £45 600) being split. The track embedded in concrete east of Bridge Road was contracted to be dug up and that from Bridge Road to the terminus at Leichhardt Street asphalted over. During the recent Glebe Point Road renovations tracks found at the eastern end were removed. In 1966 the City of Sydney bought the A V Henry Playground site, which it had leased in 1961, and the Rozelle Tramway Depot Substation. Apart from the Rozelle tramsheds, little evidence remains in Glebe of the huge tram network which once spread across Sydney from La Perouse to Watsons Bay, from Ryde to Brightonle-Sands. The bus shelter outside the Woolcock building, 431 Glebe Point Road, was originally a tramway waiting shed. It was built in 1938 to replace a starter’s cabin, dismantled and sent to Wolli Creek Depot in exchange for a kerbside bubbler for tram staff use. Glebe Council, who footed the £50 bill, criticised the contractor for slipshod work using poor concrete and too few coats of paint and predicted the structure would not last. It’s very sad that sydney has lost so much of it’s heritage. I personally think that sydney has been raped and destroyed . So much of the past is gone forever. I personally believe it’s been deliberate and goverments don’t seen too care.Or the goverments care about is developement smash this wreck that.I cry sometimes about this as sydney had so much beauty.And to think that 12 trams were being burnt every week at the former randwick workshops makes me sick .I have seen the photo’s on the internet so many politians from the past and present have really been destuctive and cruel to this place we call sydney.